Chinese model Sui He tops off an incredible Spring/Summer 2012 show season with a history making cover appearance for W Magazine's November 2012 art issue. 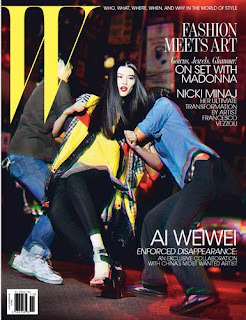 Lensed by Max Vadukal with art direction by Chinese contemporary artist Ai Weiwei, the cover features Sui He being wrestled to the ground by two unknown assailants. The cover image and accompanying editorial shot in New York, is reminiscent of Weiwei's photographic work from the Eighties Tompkin Square riots. Sui He's appearance on the cover of W is a first for models of Asian descent and is likely to cement He's status as a true contender amongst the new generation of models. 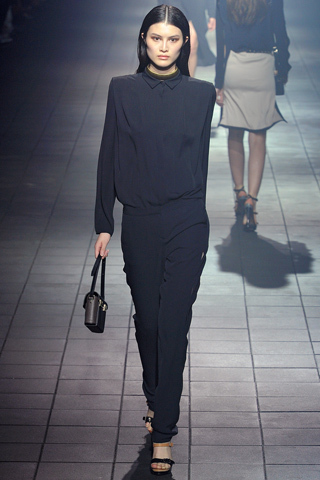 He was one of the stand out faces at the Spring/Summer 2012 shows, appearing at only the most coveted shows including Altuzarra, Donna Karan, Prabal Gurung, Michael Kors, Peter Som, Oscar de la Renta, Antonio Berardi, Acne, Max Mara, Dolce Gabbana, Costume National, Hussein Chalayan, Thierry Mugler, Lanvin, Hermes and Chanel. He's pristine beauty, killer physique and versatility in front of the lens have her marked as one of the "it" girls of the season.